Cheonjiyeon Waterfall is a waterfall on Jeju Island, South Korea. Literally, the name Cheonjiyeon means sky (Ch'eon) connected with land (ji). It is one of the main tourist attractions on Jeju-do. It is 22 m (72 ft) high and 12 m (39 ft) wide. Though water always falls in one particular area, depending on the amount of recent rain, the water may spread out. At the bottom of the waterfall is an artificial pond that is 20 m (66 ft) deep. Two small dams help keep the water at a specific level. Large volcanic rocks form landbridges that allow tourists to pose for photographs in front of the falls. These falls are characterized by its trachyte andesiterocks. The pool is now off limits to visitors, apart from once every second year during the Seven Nymphs Festival. For a single day in May on even years, people come from all over the island to swim in the pool and sample the healing properties of its water. The source of Cheonjiyeon Waterfall is a spring that comes out of the floor of the Somban Stream. The stream Yeonhee-chun is the source of the waterfall. 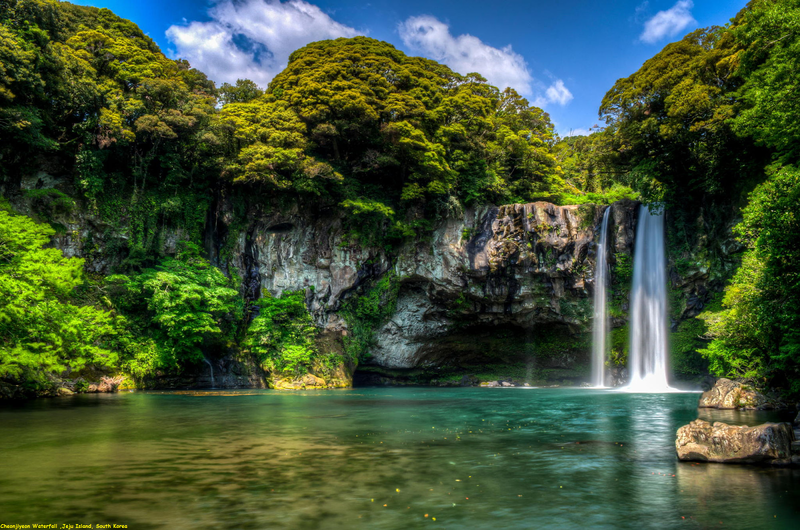 The waterfall is one of the three famous waterfalls of Jeju, the other two being Cheonjeyeon Waterfall and Jeongbang Waterfall.